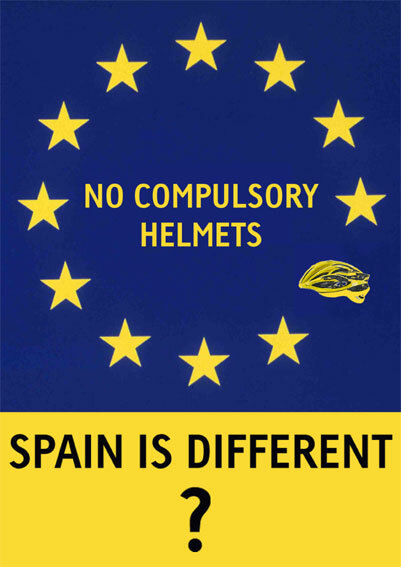 On behalf of ConBici and all Spanish cyclists I would like to thank the Road Danger Reduction Forum for their support in opposing plans by the Spanish government to ban cycling without helmets. With your help we are winning the argument in the media, but government has not yet shown any indication that it will change its plans. Some 20 city councils (including Madrid, Barcelona, Valencia, Zaragoza, and Bilbao) have publicly called for the proposals to be scrapped, so even if the government does ban cycling without helmets, it will probably be unable to enforce the law as the local councils control the city police forces. However, even this very pragmatic consideration leaves the government unmoved. If you wish to follow events, the CTC and the European Cycling Federation are covering the story as it unfolds on their websites. For an update, take a look at this post. There is a petition you can sign and also write – in Spanish or English to the Spanish Government Minister. This entry was posted in Cycle helmets, Cycling, Law on May 7, 2013 by rdrf.